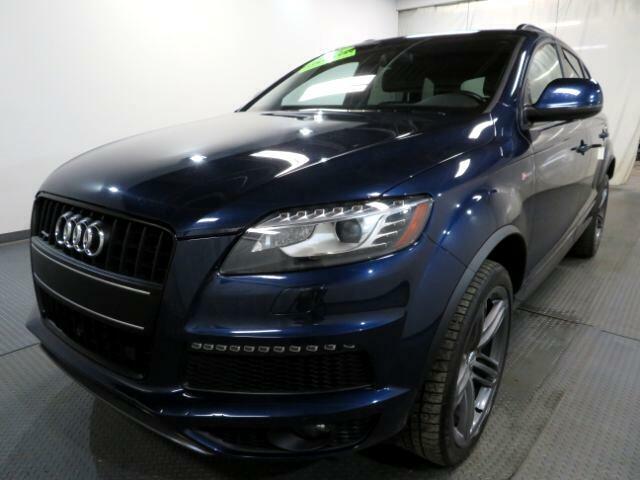 Another year has come and gone, yet the aging 2015 Audi Q7 continues to stay the course. The Q7 is a seven-passenger luxury SUV that features an upscale driving feel and a plush interior, but it hasn''''t changed that much since it was introduced in 2007. With newer rivals offering clear advantages in various respects, the 2015 Q7 is difficult to recommend. To be fair, there are still some things to like about the 2015 Audi Q7. The interior really is quite nice, with high-quality surfaces and excellent build quality. A big part of what earned the Audi Q7 an Edmunds B rating involves its comfortable and quiet interior. As far as engines go, the optional TDI diesel-powered V6 delivers an impressive 28 mpg on the highway, along with a healthy wallop of torque for passing or hill climbing. The Q7 is also surprisingly nimble for such a large vehicle, inspiring confidence where some other three-row luxury SUVs would feel bulky and out of sorts. ***Internet special. Price reflects discount for cash buyers. Traditional and special financing is available for qualified buyers. Please contact us first for availability as our cars go fast at near wholesale prices. Prices are subject to change. Sales Tax, Title, License Fee, Registration Fee, Dealer Documentary Fee, Finance Charges, Emission Testing Fees and Compliance Fees are additional to the advertised price. All options and conditions of the vehicles must be verified with the dealer, any descriptions or options that are listed maybe incorrect due to automatic data transfer.